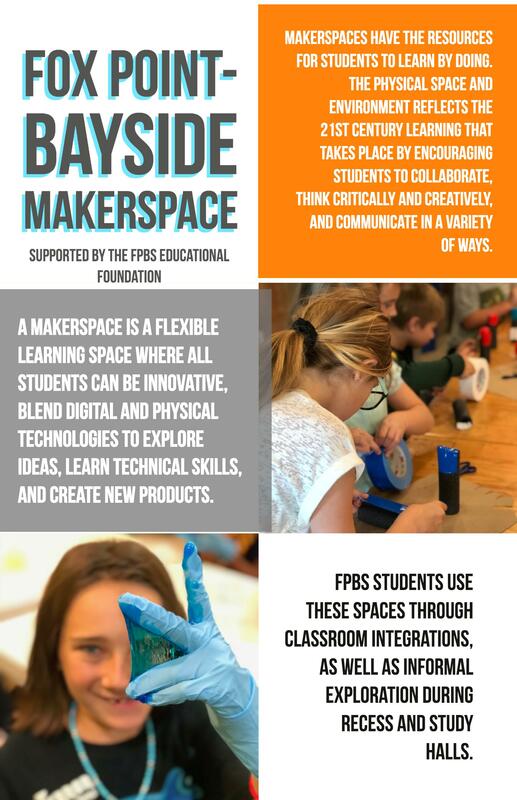 The Fox Point-Bayside Educational Foundation, Inc. is a non-profit, 501(c)(3) organization comprised of a volunteer group of parents and community members dedicated to enhancing the learning environment of students at Stormonth Elementary and Bayside Middle Schools. The Foundation supports District initiatives and capital improvements to school property, equipment for classrooms and buildings, and special projects. Since its inception in 1993, the Foundation has provided items ranging from mobile computer labs, Smartboards, and sound systems to defibrillators and landscaping projects. Your commitment has helped make our schools better, our kids brighter, and our teachers happier. Looking to donate? Use the link below to make a PayPal donation to the support our schools. If you would like to learn how you can be a part of the important work of the Foundation, you may contact one of the members of the Foundation's Board, attend a meeting or complete a volunteer sign-up form online – district website. Parents and community members partnering with our schools through the work of the Foundation make a positive difference for our community. To find out more about this exciting initiative, please check out the links below!